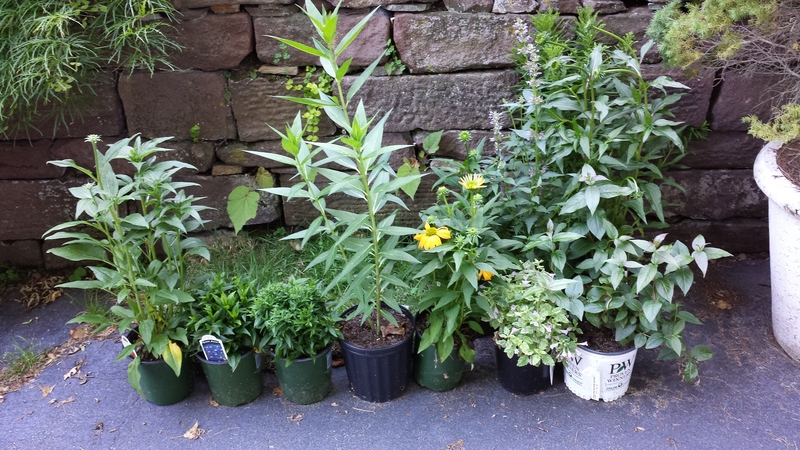 A week or so ago I showed some annuals and tropicals that I had for my pollinators. I also mentioned that I was re-planting a portion of my garden that had succumbed to weather. I say “weather” because I don’t believe it succumbed to our harsh winter–at least not entirely. These were hardy perennials well suited for my zone (I always chose plants for zone 5 even though, according to the charts I’m at least a zone 6, just because of the difficult conditions of wind and heavy wet clay). Further, most of them had been in that particular garden for 10 years or more. A few of the milkweeds (yes, I lost 3 different varieties of milkweed–none of them tropical–I know better–one of which had been there for 20 years!) were recent additions but most of the garden was very well established. So what do I think happened? You heard me say it. The garden was very well established. You also know that at my house, the garden get tough love. No additional water, no nothing. Last summer, we had 4 inches of rain in a four month period–and 2 of those inches fell on 1 day in July so it was a very dry summer. That garden was wilting a significant portion of the time. Couple that with an exceptionally cold winter–the earlier portion of which was snowless–and I think that’s why I lost so much. Sad, yes, but not a total shock. That’s the only garden where I lost plants–and of course, I didn’t lose all the plants. And interestingly enough, I didn’t lose the ridiculously thirsty hydrangeas. Go figure. So now I have an opportunity to re-plant. And with the exception of the one variegated plant in the photo (it’s a catmint and I know for a fact that catmint is a bee magnet! ), all of the plants in the photo are natives. Next to that are two asters–the variety escapes me at the moment but they are deep purple and dwarf. Then milkweed, of course. One is already in the garden. This one is here because I’m taking it to a lecture Monday. Then it will go in beside it. Then more echinacea (the yellow) with some agastache ‘blue fortune’ near it, as well as the variegated cat mint I mentioned earlier. Finally, all the way on the right, in the white Proven Winners pot is a native bush honeysuckle (diervilla) Kodiak Black. Behind it is a goldenrod. I have lots of goldenrod elsewhere in the yard planted by who knows what but I thought I should actually plant some myself as well! The pollinators should be happy. I know I will be!